When it comes to pumpkins these days, white is the new orange! 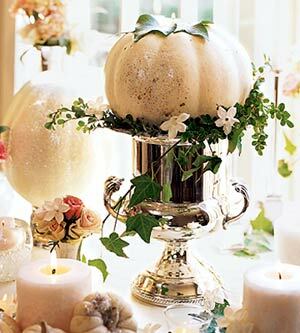 My favorite centerpiece inspiration photo is this silver wine bucket with a white pumpkin. Perfect for a fall wedding! Who knew pumpkins could be so elegant! No longer just the traditional orange, the new heirloom green and white pumpkins look wonderful as a fall tablescape centerpiece. 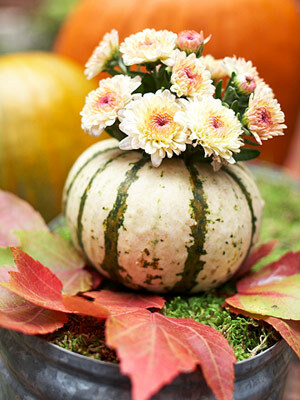 I like the idea of carving out pretty pumpkins and using them as vases. 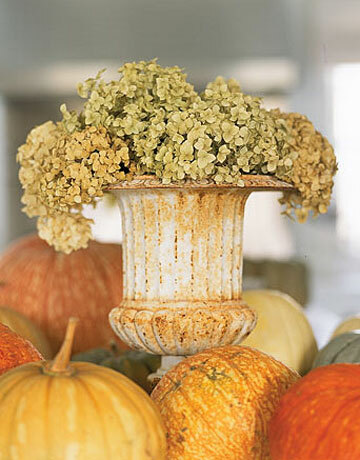 Without the typical fall colors, wouldn't this table top vignette look wonderful in an all white or neutral room? 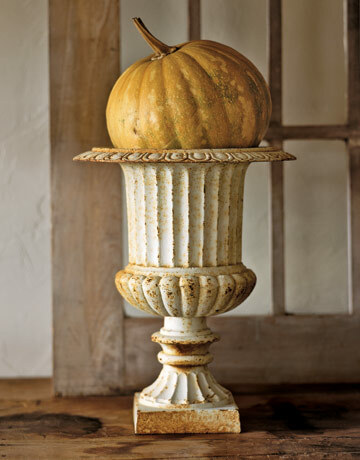 Even just a simple gold pumpkin in a rusty urn would look elegant on the table, but also on the mantle. The same rusty urn with dried hydrangeas. They look wonderful with pumpkins all around. 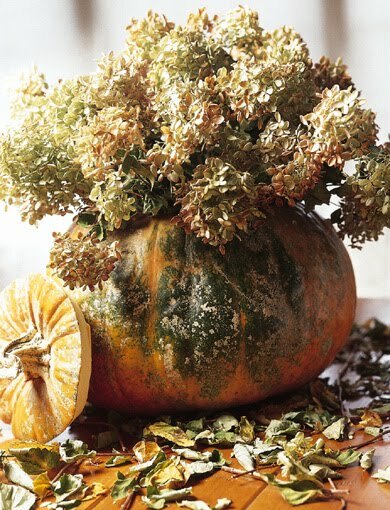 In fact, hydrangeas and pumpkins look fabulous together, don't you think? 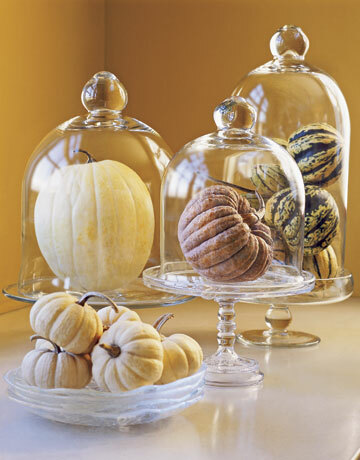 Here is another simple centerpiece idea, crystal cake stands with pale pumpkins under glass. Very elegant, uncluttered and so easy to create. Here is a rustic and earthy centerpiece that has a little bit of everything. It would take you all the way to the holidays! I'm really loving this because I have a similar wooden tray and plan on filling it just like the one above. I already have lots of pine cones, gathered leaves from the maple trees down the street, little pumpkins, gourds, pomegranates, apples and some moss! Just add the candles and done! What I also like about this centerpiece is that it can all be real. No need for faux here. Everything is found at the grocery store or outside on the ground! I'm joining Artie at Color Outside the Lines for Vignette Fridays. Be sure to visit his fabulous blog and also check out the other participants for more inspiration. All the photos are great! You should work for Houzz! :o) I saw a 'Labor Day' flower arrangement of red glads, white mums & forget the kind of blue flower, but they were in a watermelon, and that was also a really cool look that would also be great for Veteran's Day, Memorial Day, July 4th or 9/11 Remembrances. Beautiful and very inspiring images! I too love the whites. I ran around to 3 different places yesterday and only turned up the small ones. Am I behind or were the crops smaller this year? Just gorgeous...love the gold pumpkin simple placed in the urn! 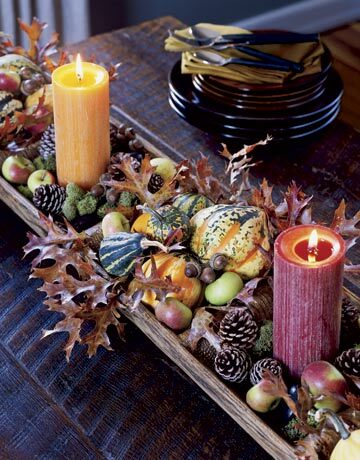 Fabulous images of elegant takes on fall decor. The top picture though is my fave. Thanks for sharing the beautiful inspiration pictures. It would be hard to pick a favorite. Some great ideas for fall. I must start thinking about it! 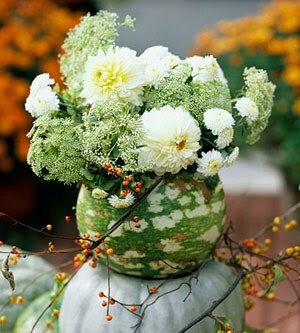 I am SO doing the hydrangea in the pumpkin idea!!! 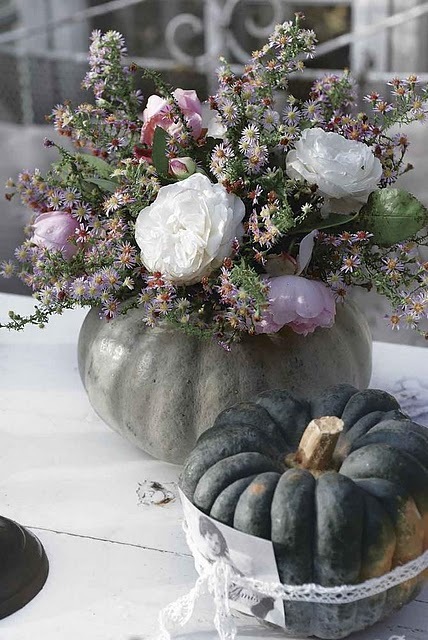 Love the white pumpkin in the silver urn. Beautiful! I love the green stripe pumpkin with the leaves around the base. Very pretty ideas. * WONDERFULLY INSPIRATIONAL, Delores!!! Many thanks for sharing your beautiful ideas! I love the pumpkins in the urns! I have some just like those with nothing in them! Perfect! thank for the all the inspiration! What great ideas. Love those white pumpkins. I have had such a busy week and my pumpkins are all just sitting here waiting for me to do something with them. Your images have inspired me. I remember that you once did a post about the hydrangeas being the perfect flower, and it certainly is true...just look at these gorgeous images! Thank you for the inspiration. Hope you are having a lovely weekend. I had to steal the pumpkin in the silver ice bucket - I have a beautiful Italian bucket and never know what to do with it - my white pumpkin has a new home thanks to you!